The researchers investigated faulty versions of a gene called titin which are carried by one in 100 people or 600,000 people in the UK. Titin is crucial for maintaining the elasticity of the heart muscle, and faulty versions are linked to a type of heart failure called dilated cardiomyopathy. Now new research suggests the faulty gene may interact with alcohol to accelerate heart failure in some patients with the gene, even if they only drink moderate amounts of alcohol. The research was carried out by scientists from Imperial College London, Royal Brompton Hospital, and MRC London Institute of Medical Sciences, and published this week in the latest edition of the Journal of the American College of Cardiology. The study was supported by the Department of Health and Social Care and the Wellcome Trust through the Health Innovation Challenge Fund. In the first part of the study, the team analysed 141 patients with a type of heart failure called alcoholic cardiomyopathy (ACM). This condition is triggered by drinking more than 70 units a week (roughly seven bottles of wine) for five years or more. In severe cases the condition can be fatal, or leave patients requiring a heart transplant. The team found that the faulty titin gene may also play a role in the condition. In the study 13.5 per cent of patients were found to carry the mutation – much higher than the proportion of people who carry them in the general population. These results suggest this condition is not simply the result of alcohol poisoning, but arises from a genetic predisposition – and that other family members may be at risk too, explained Dr James Ware, study author from the National Heart and Lung Institute at Imperial. "Our research strongly suggests alcohol and genetics are interacting – and genetic predisposition and alcohol consumption can act together to lead to heart failure. At the moment this condition is assumed to be simply due to too much alcohol. But this research suggests these patients should also be checked for a genetic cause – by asking about a family history and considering testing for a faulty titin gene, as well as other genes linked to heart failure," he said. He added that relatives of patients with ACM should receive assessment and heart scans – and in some cases have genetic tests – to see if they unknowingly carry the faulty gene. In a second part of the study, the researchers investigated whether alcohol may play a role in another type of heart failure called dilated cardiomyopathy (DCM). This condition causes the heart muscle to become stretched and thin, and has a number of causes including viral infections and certain medications. The condition can also be genetic, and around 12 per cent of cases of DCM are thought to be linked to a faulty titin gene. In the study the team asked 716 patients with dilated cardiomyopathy how much alcohol they consumed. None of the patients consumed the high-levels of alcohol needed to cause ACM. But the team found that in patients whose DCM was caused by the faulty titin gene, even moderately increased alcohol intake (defined as drinking above the weekly recommended limit of 14 units), affected the heart's pumping power. Compared to DCM patients who didn't consume excess alcohol (and whose condition wasn't caused by the faulty titin gene), excess alcohol was linked to reduction in heart output of 30 per cent. "Alcohol and the heart have a complicated relationship. While moderate levels may have benefits for heart health, too much can cause serious cardiac problems. This research suggests that in people with titin-related heart failure, alcohol may worsen the condition. "An important wider question is also raised by the study: do mutations in titin predispose people to heart failure when exposed to other things that stress the heart, such as cancer drugs or certain viral infections? This is something we are actively seeking to address." 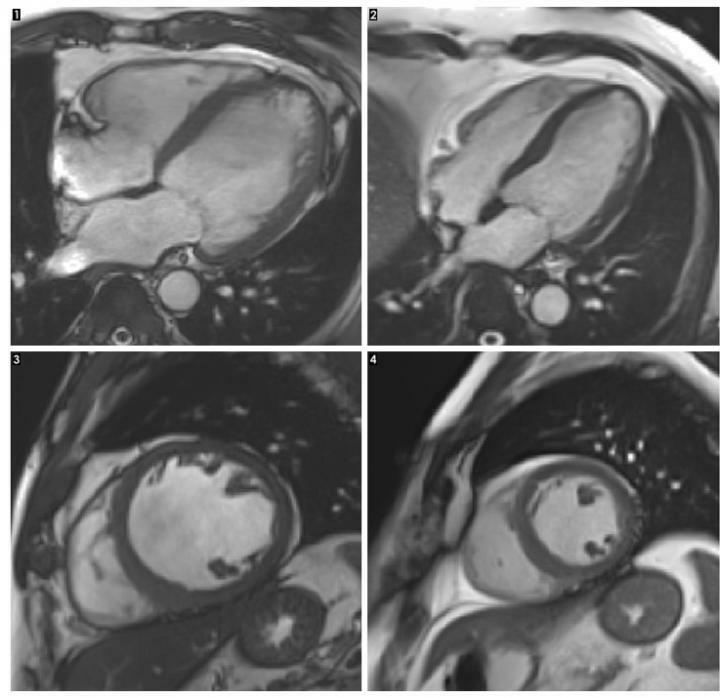 GIF caption: This MRI image shows a heart with the condition alcohol cardiomyopathy. This is a form of heart failure, triggered by long-term excess alcohol, that causes the main pumping chamber of the heart (the large area on the bottom right of the heart in the image) to become enlarged. This reduces the heart's pumping power, and in serious cases requires a transplant. The research was supported by the Department of Health and Social Care and Wellcome Trust through the Health Innovation Challenge Fund, the Medical Research Council, the NIHR Cardiovascular Biomedical Research Unit at Royal Brompton & Harefield NHS Foundation Trust and the British Heart Foundation.